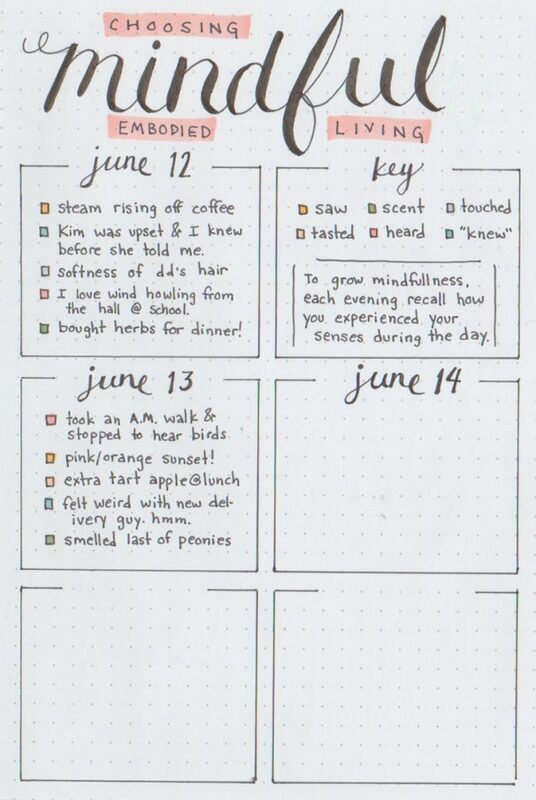 I’ve been slowly revamping some of my bullet journal layouts in the last few months. 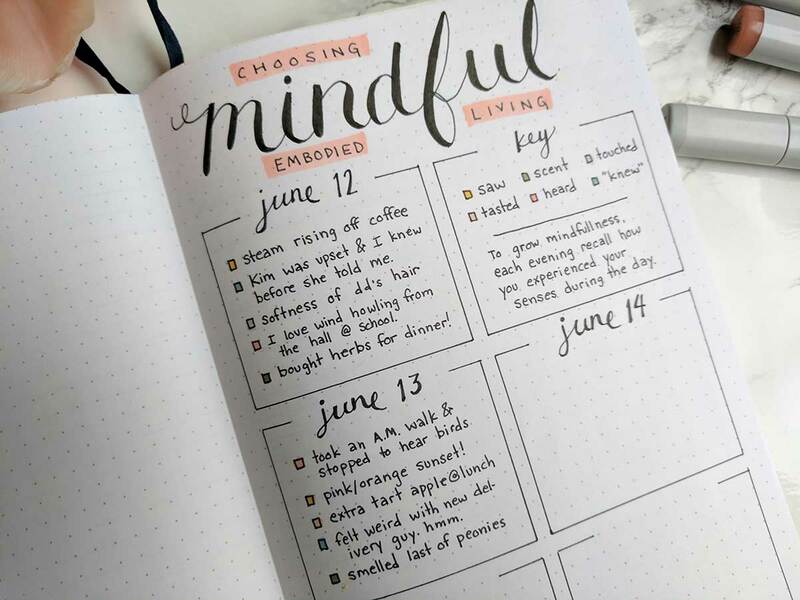 I’m still loving the content, but finding bullet journaling is more fun and less overwhelming for most people when putting together a layout doesn’t require a large amount of time just to prepare a page to begin journaling. 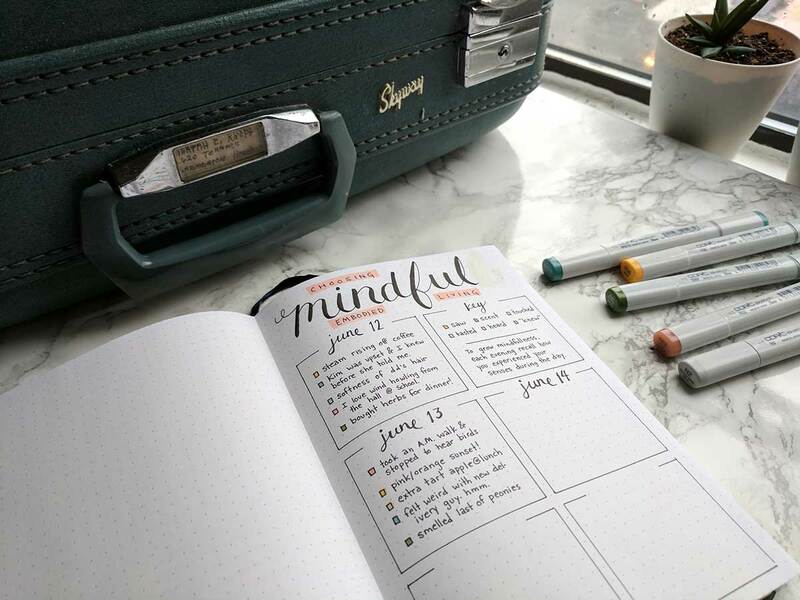 Instead, I’ve been focusing on minimalist bullet journal layouts that make it easy to get started tracking. 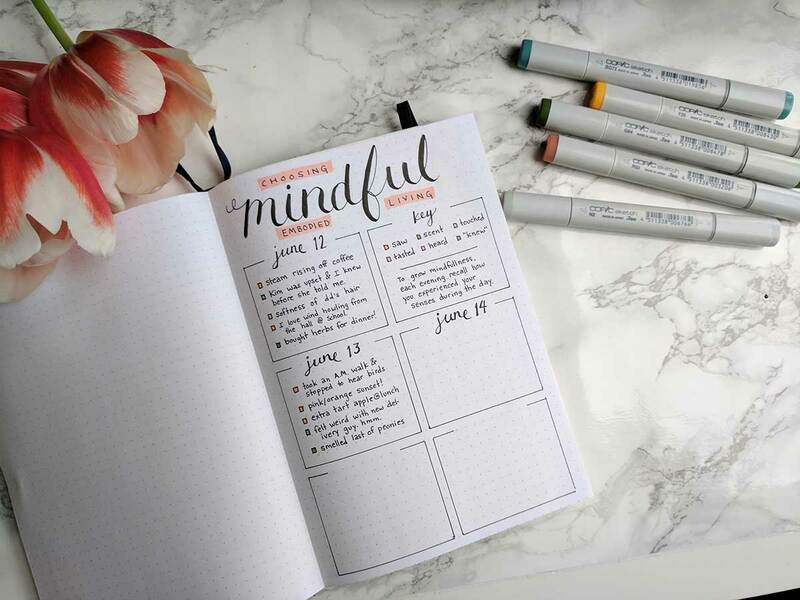 What’s New in this BuJo Mindfulness Layout? 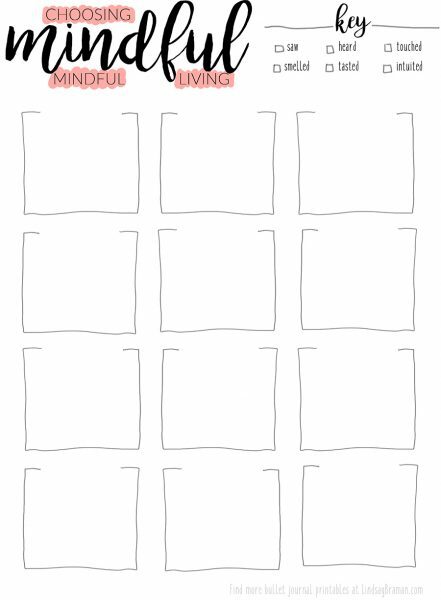 Primarily, the layout requires less doodling and instead leaves lots more room for tracking. In this layout, more freedom is given to the user to fill out each day however they’d like. (previous versions had a line for each sense.) I still think it’s important to try to attend to each sense each day, but this new layout gives the user the agency to choose. Instead of a label on each and every line, this layout uses a color-key that you get to color yourself to identify which entry is which sense. You can use colored pens or write in black with a pretty highlight color behind to designate. 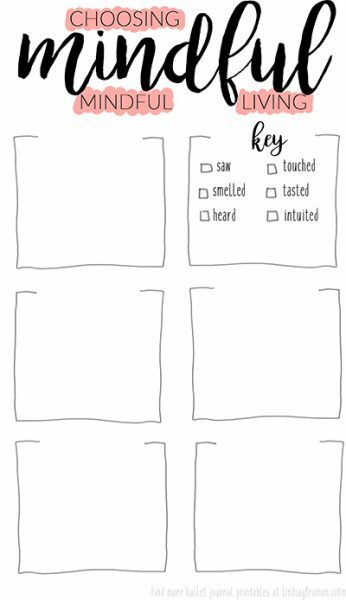 For the first time with this layout, I’ve also made available blank printable versionsso if you aren’t into creating your own layouts you can just print mine and be ready to go. Sized in either a full 8.5×11 sheet or a nournal friendly 5×8.25 size, these can be downloaded at the end of this post. 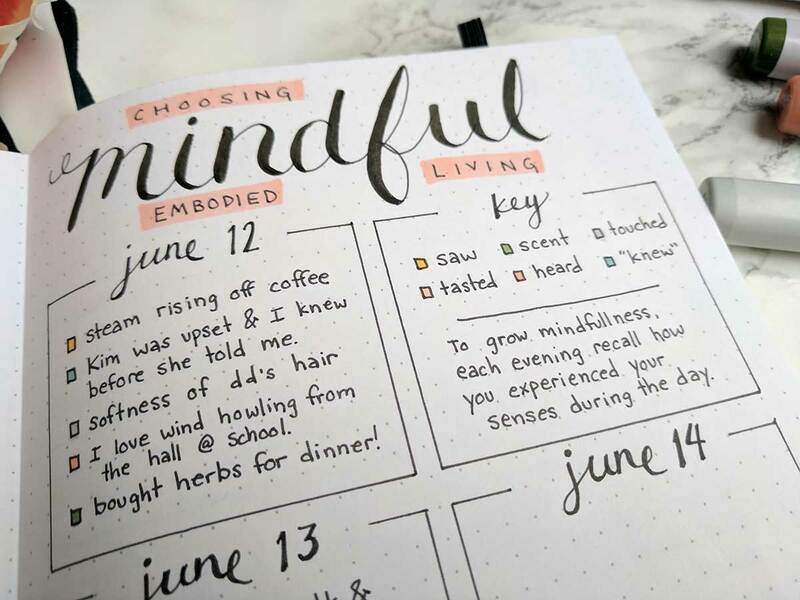 HOW TO USE: As you complete this layout, take a few moments to remember and notice the sensory feelings you had this day and the experiences surrounding them. That’s really important, ya’ll. Remember mindfulness is in the remembering, processing, and feeling, not in the tracking. Take time to re-experience these moments of your day. For example: For “Hearing”, think: What was the noise? When did I first notice? What did I feel about that sound? Did I strain to hear or was it so loud it was all I was aware of? 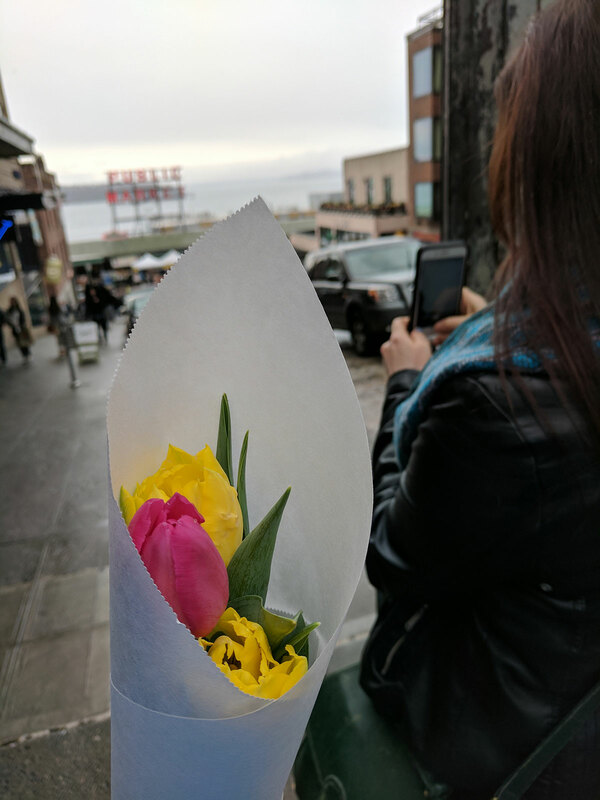 Digital life can draw us away from sensory experiences. 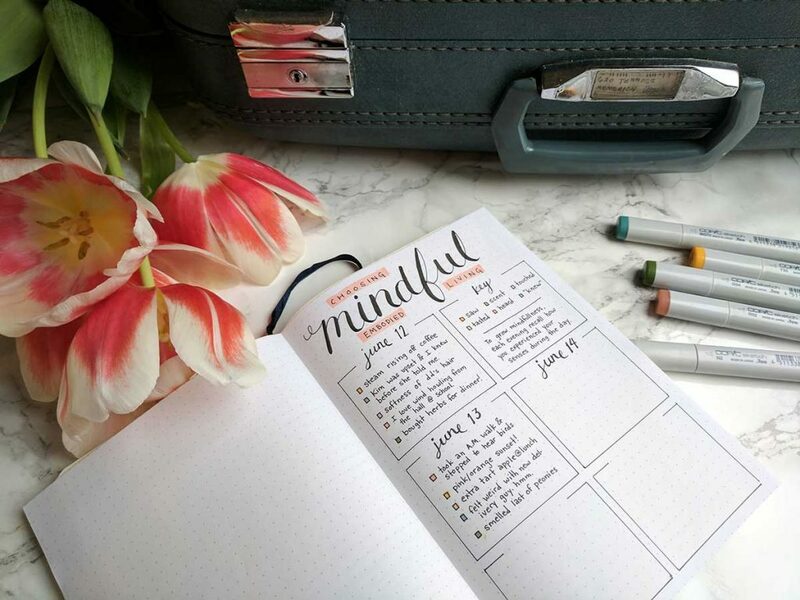 It’s ok to be a social media maven, but this bujo layout will help you develop the reflex to mindfully be present to the world in a physical way too. A note on the 6th Sense: YES. I include a 6th sense: “knowing” or intuition. Human beings have an ability to read our environment and “know” things about people and places. If we pay attention, this sense helps keeps us safe and helps us to know how to care well for others, when we don’t pay attention, we can full to that sense and repeatedly find ourselves moving into relationships and situations that harm us. Most of us don’t pay attention to our intuition- we were taught long ago to ignore our body’s cues and “be nice” instead of practicing reading a situation well and trusting our instinct. Practicing a habit of naming and honoring your inner ability to read a person or situation correctly can improve your sensitivity and trust in your own intuition, and trusting your intuition can save your life. 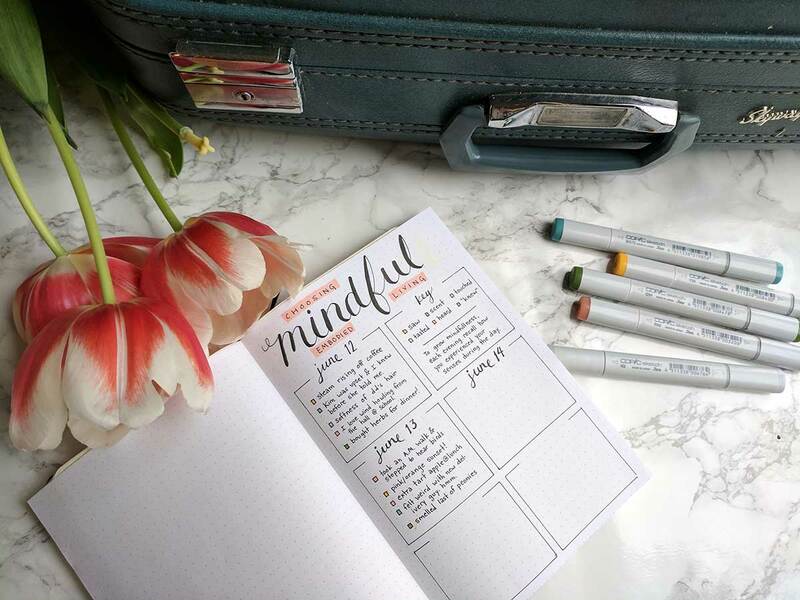 Why Bullet Journal About Mindfulness? 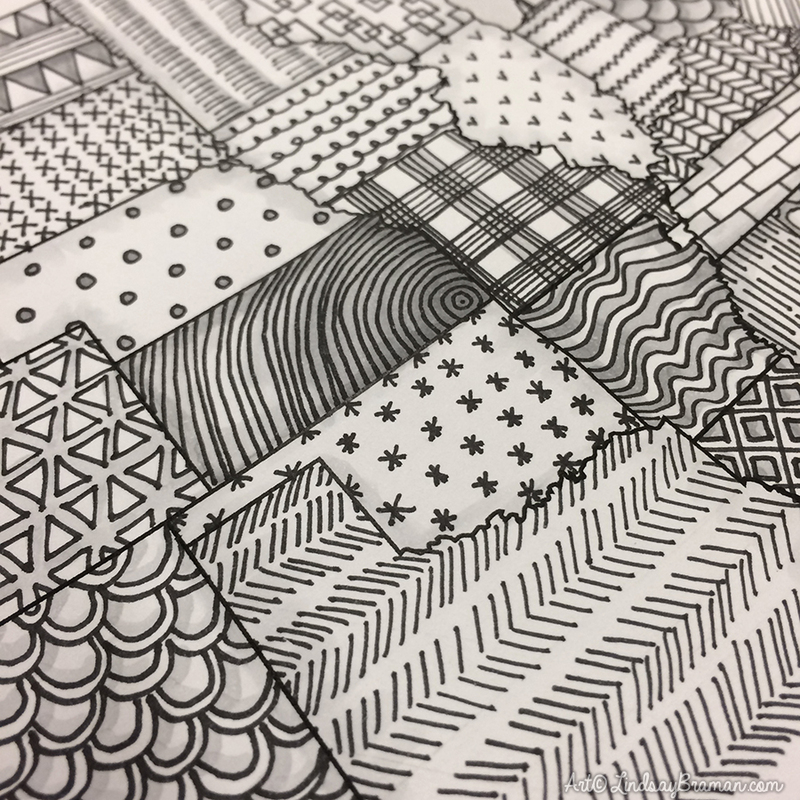 I get frustrated by the mindful coloring book craze. From a neurological/psychological perspective, there is a HUGE difference in coloring and mindfulness- the activity of coloring is not, in itself, a mindful practice. Instead, using these books is more often a way to disengage from stress or a way to “check out” after a long day. This has benefits as a stress reduction technique, but is not mindfulness. 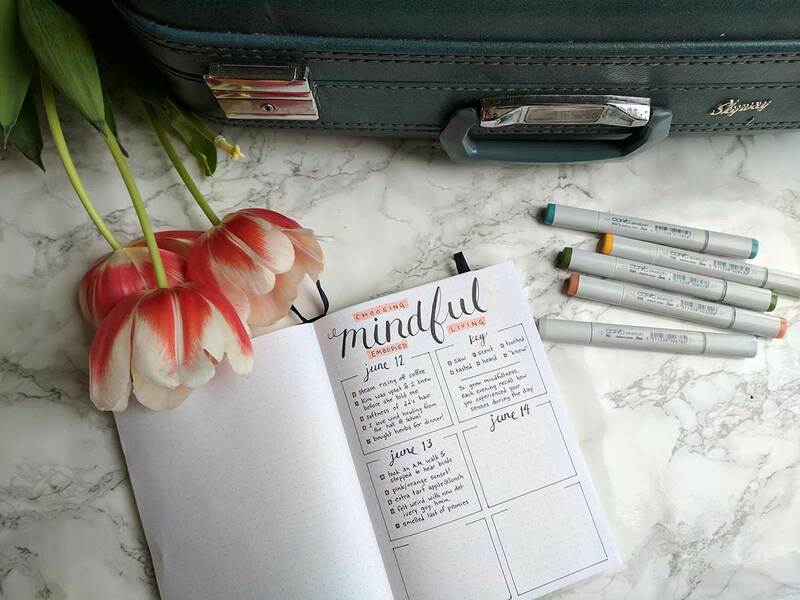 Then what IS mindful adult coloring? 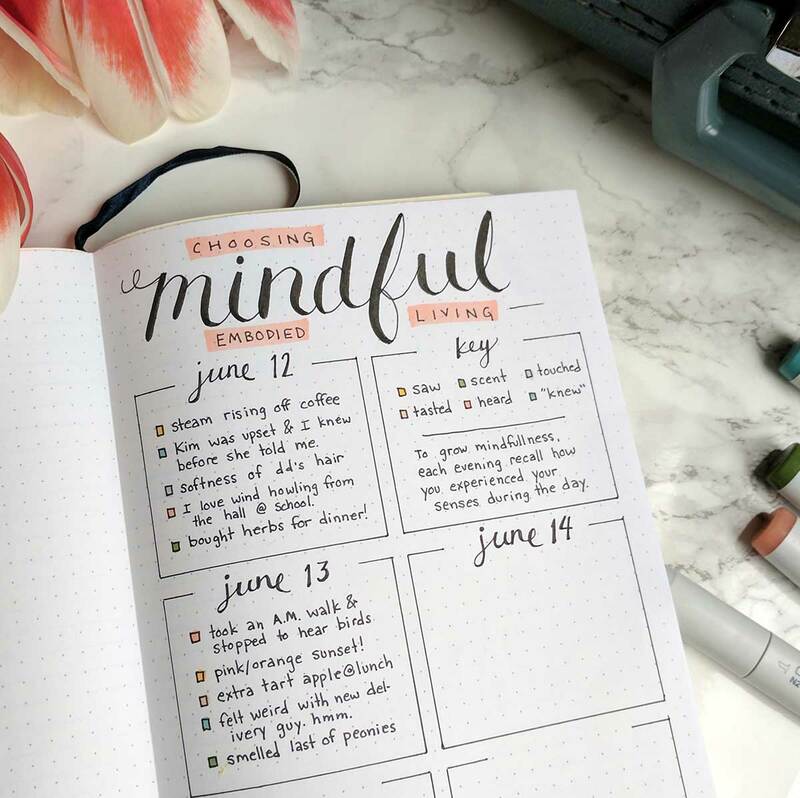 Mindful coloring means slowing down and taking time to be aware of all five senses, notice what you are sensing, and letting what you notice pass in and out of your awareness without judgement or reaction.